About three weeks ago, we introduced you to Templatemonster, a service with a catalogue of 30,000 templates for sale. Today we are happy to be able to announce an exclusive giveaway. 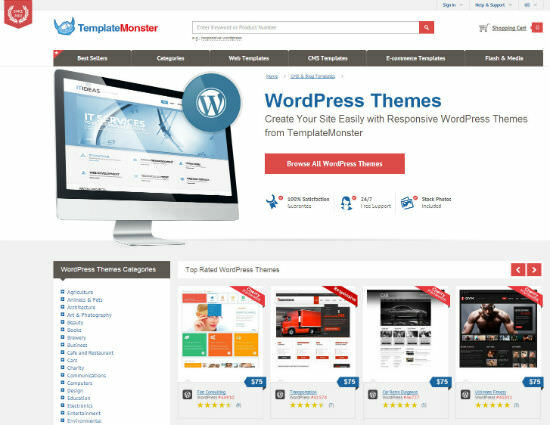 We teamed up with Templatemonster to give five of our readers the chance to win their personal favorite from Templatemonster’s large WordPress theme collection of over 2,000 themes. All you need to do is tell us your favorite in the comments section. If you’ve read our previous article on Templatemonster, you know what to expect. A veteran in its field, the service hosts a vast variety of different templates, themes and presentations. And while there actually are around 30,000 templates and themes for all kinds of CM systems and also plain HTML/CSS, our giveaway focuses on the large repository of around 2,000 WordPress themes. Browse through the collection and choose your personal favorite. Then enter a comment such as “Item number 45051 is my favorite theme” and you’re in the draw. Don’t forget to enter a functional email address, so that we can actually reach you in case you win. And though you are absolutely free to choose whichever WordPress theme you like, you might be particularly interested in the latest and greatest. 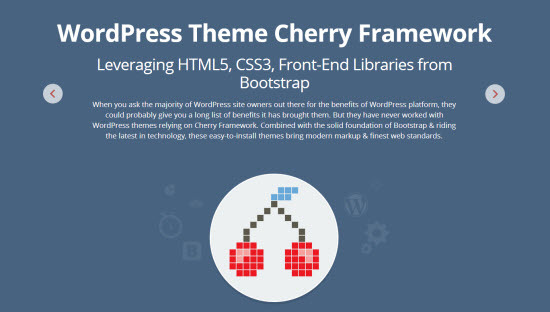 The latest and most powerful TemplateMonster WordPress themes are based on the Cherry Framework. 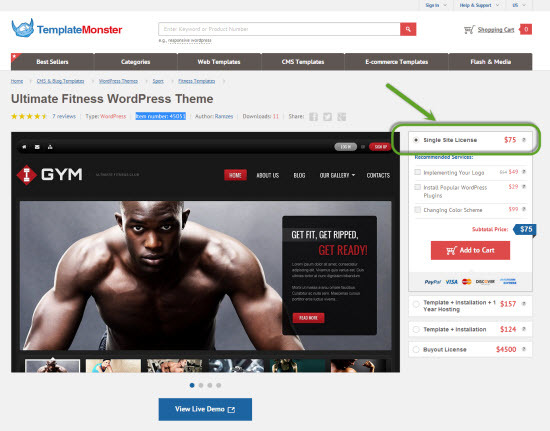 This is a new framework for WordPress invented by the TemplateMonster team. You can read about it here. The framework is free and comes with free updates. There are more than 500 Cherry themes on templatemonster.com and new themes are released every week. So it should come as no surprise that the Cherry framework has a huge collection of child themes. 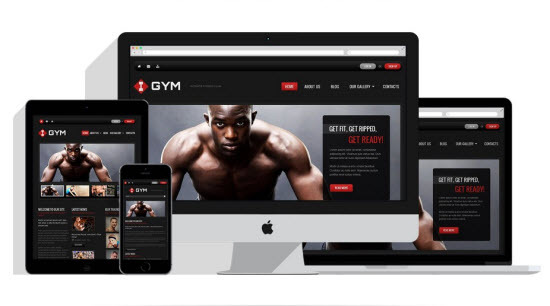 All the themes are responsive. Coded with HTML5, CSS3 & based on Bootstrap. Each theme is packed with 20+ different Post Types and 100+ shortcodes to make the editing process as easy as possible. Each Cherry theme is SEO friendly and WPML-ready. If we sparked your interest now, be sure to check this page. It shows all themes powered by the Cherry Framework. Now, if you choose or don’t choose a Cherry-based theme is totally up to you. In any case and in case you win you will get the Single Site License of your favorite theme, worth 75 USD. The game starts immediately and runs until Tuesday, 8th of April 2014, 6 pm CEST. There are no regional limits for participation. The license will be delivered digitally, so the only thing you need to partake is internet access and a functional email address. Make sure to choose a WordPress theme, not Joomla, Drupal or one of the other offerings. Good luck! Item 46907 is my favorite theme! Item number 47929 is my favorite theme. Wedding Planner Responsive WordPress Theme – Item number 48420 is my favorite theme. Template #46785 would be an awesome template to help me upgrade my existing website! Really loving the versatility of #28721 but so many great themes to choose from. I like this template most. #28721 but so many great themes to choose from. I like this one #40186 but many others too. It’s hard to choose one out if them. Item number 47786 is my favourite theme – loving the dinosaurs ;)! theme46727 perfect for the client. Item number 44948 is my favourite. Any of the Cherry Framework responsive sites. I’d like to win #48844 (WordPress theme). I like the vertical menu layout which is quite rare these days. I think it would be a very versatile theme and could be styled to suit many different business options. And it’s responsive too! http://www.templatemonster.com/wordpress-themes/36893.html Item number: 36893 i found this theme very intersting…. i am a new blogger… i am a student so i don’t have money to buy a premium theme… that’s why i am looking for a theme to start my blog…. I’d like to win 36176 to make my buddy a new website!